I like New Year's Resolutions, so I'm trying to work out what I have the strength of character to resolve to do this year. I started this on January 17th. I did it thinking I might do it for a year. She's my first born, I pushed her out, hot and urgent while biting the stuffed rabbit my great-great-aunt Nell gave me the last Christmas she was alive. She was born purple, with navy blue eyes. She's clever and competent, and in her stories every horse has a different neigh. We've been going to Playcentre together for more than four years, and tomorrow is her last day. There'll be a cake, and a decorated chair. There'll be presents; she's giving the Playcentre a horse (one hand high), rider, and tack. 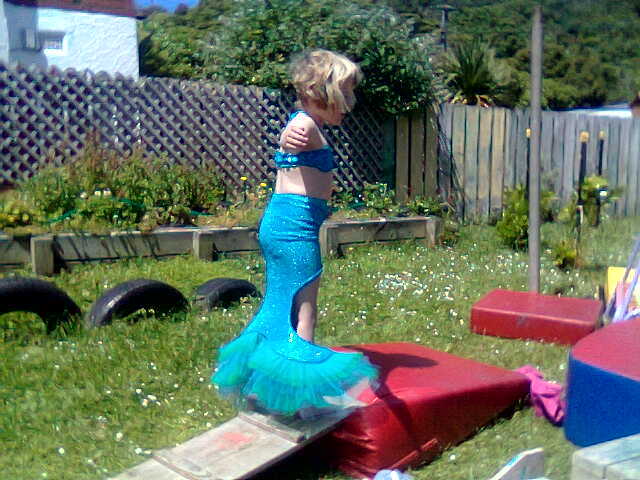 It's giving her a mermaid top and tail (Iris and I were the representatives of Playcentre who chose the present). There'll be a card with pictures, best wishes and hugs. There may be speeches. I took housemonkey to Emergency last night after he'd leapingly caught a disc with one hand and landed rolling his ankle off a shoe. The new easy-to-find location and airport-styled waiting room have not changed the experience significantly since I broke two metatarsals, a finger, and sprained my own ankles about three times in the seventies and eighties. We arrived before 11pm and didn't get out until after 2am but, compared to my imaginings of doing the same thing for Hazel or Iris, it was a pleasure. Fey humour is much easier to listen to than shrieking, and if he thought I should have been magically making it better instead of just sitting there he was too polite to say. Ooooh, ninja t-shirt folding, now this is addictive. Of course the kids are scattering today: fabric scraps, old coins, dice, (but not yet food!) and so the house is a tip, but I can tell you, the t-shirts are origami. Hazel wants to go to Tumble Tots very much (and whatever I think of their modeling, the kids' sheer enthusiasm for the programme won out in the end). So she started getting dressed early, which is good because while Hazel needs to get dressed before she can go to Tumble Tots, Hazel wants to get dressed in private. Hazel decides in order for her room to be private it needs a sign on the door. Hazel is not yet five, she writes very very slowly, after an hour's work the sign says "CEpOtDAng" which means "Keep Out, Danger" it is a huge achievement and she has to celebrate her new sign before she gets dressed (in the public playroom). Iris also wants to go to Tumble Tots very much, she also needs to be dressed before we can go to Tumble Tots, unfortunately, just after she manages to become willing to take off the beautiful nightie that Anne made her that says "Sleep well Iris" and has a kiss in the pocket, she finds the bag of fabric scraps I was given yesterday and gets the urge to design clothes made out of them that would be perfect for Tumble Tots. I do not have time to sew her new clothes before Tumble Tots. Susan would prefer the children go to Tumble Tots than to pass the day with grumpy children who missed out. In order to go to Tumble Tots her children need to be dressed. She could spend her time putting the fabric scraps away again, stuffing her children into clothes suitable for Tumble Tots and writing Hazel's sign, or in a consultancy role: talking them through making their own choices and surfing the web. Oh well, so much for time management skills, I guess it's time to start modeling working well under time-pressure. Want more? See Wikipedia on priority inversion. Hazel's been coughing at night during the weekend, and last night she complained about her ear hurting, Iris had lots of nightmares last night and was hot to the touch. I took them to the doctor this morning. Turns out Hazel's been much more valiant in her wonderful bee performances than I realised, she has quite a rattly chest but the show went on anyway. Iris also has a chest, and some other part of her body (not ears, maybe tonsils, I'm a bit short on sleep and can't remember), she's quite floppy today. This is what DVDs were invented for. Poor wee Iris is squeaking with nightmares, I'm sitting by her and making comforting typing noises while she re-settles. We started our new role-playing campaign today. I am optimistic about it. We're playing some people employed (or about to be) by the Lucky Ali Detective Agency (est. 2189), but before we got to that the GM gave us a fairly serious action piece using pre-generated characters who broke a guy out of a subterranean and Antarctic prison. My current group is good. Everyone's able to drop into different characters fast and well and so doing various parts of the story/world (whatever it is that we make up when we do this thing that we do) is going to be rather a pleasure. We then got to Tazeem Willoughby (who sprang so oddly fully-formed out of my forehead a couple of weeks ago) and Lucky Ali interviewing the others, the candidates and the current staff of the agency are weird and wonderful, intriguing people all of them. I'm looking forward to finding out more about them, and about Tazeem. Backstage at Hazel's ballet show I've been watching how dancers talk differently from normal people and thinking about how Tazeem (who is a dancer) will use hand gestures and body language a good deal, along with rather stagey facial expressions. I'm also considering starting a Theatre Thing (dress ups, drama, dance, music, and movement) for pre-schoolers with a friend of mine who's a trained teacher and, like me, spent a long time at Drama Christi. We're just talking it through at the moment, but it feels like a gap in the community, and it's certainly something we could do. Sweet dreams my cheery little Iris who laughs at my jokes, you deserve them. She was glorious, of course. Today Hazel was the lead bee in Lynley Anne Ward's dance school show The Dream. I so did not expect to be a ballet mom in ten years time a decade ago, but hey, we adapt, and I nearly burst with pride as she remembered every part of her dance and did it with her customary precision. I was also very proud of all the children I'm friends with who were in the show, and of Felix Sampson who played the Paper Boy in the jazz and tap show, although I've never heard of him before. He's about 10 now I guess, and he's got presence all over the stage, he can dance, he can clown, he can capture an audience with a knowing look against a background of leaping girls in violet and ultra-green polka dotted dresses. We'll be hearing of him again I think.